SpaceX’s thirteenth operational Dragon mission is the first in an extension to the original Commercial Resupply Services 1 contract under which SpaceX received an additional eight and Orbital ATK an additional three missions to bridge a gap until the CRS-2 contract round goes into effect, covering the Station’s cargo needs through 2024. It is the fourth Dragon mission in 2017, setting a new record for SpaceX cargo missions completed in a calendar year. 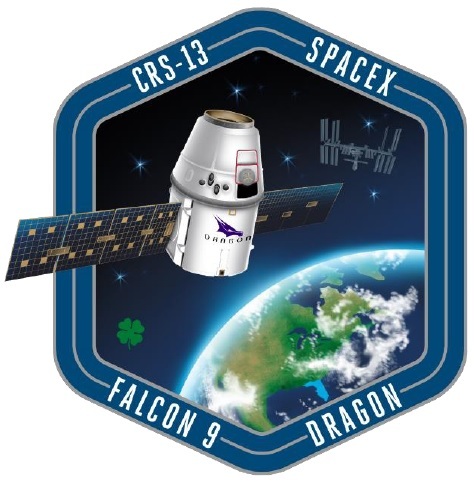 The SpX-13 mission is the first to involve two re-use elements, following up on the first re-flight of a Dragon spacecraft on the SpX-11 mission and building on SpaceX’s success in the area of booster re-use. Dragon C108 first flew in April 2015, spending 37 days in orbit as part of the SpX-6 mission that delivered two metric tons of cargo to ISS. 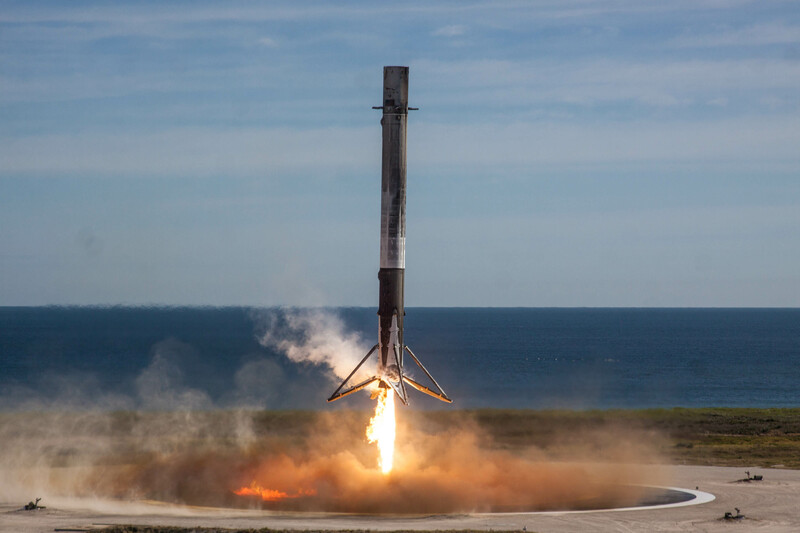 The first stage of the Falcon 9 tasked with lifting Dragon SpX-13 first flew on June 3rd, 2017 when it helped dispatch the SpX-11 mission into orbit. 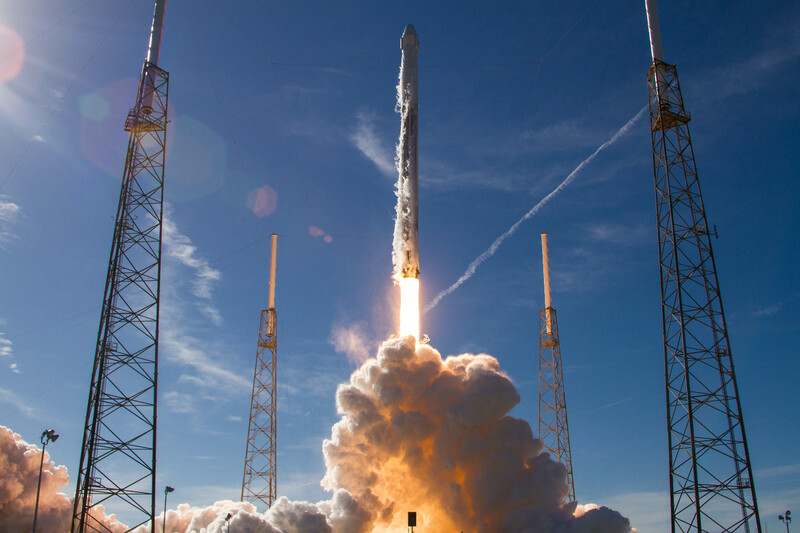 Dragon SpX-13 lifted off from Cape Canaveral’s re-built Space Launch Complex 40 at 15:36:09 UTC on Friday, marking the re-opening of SLC-40 after 15 months of downtime. Embarking on its second trip to the edge of space, Falcon 9 booster #1035 was in action for two minutes and 21 seconds to accelerate the stack to 1.7 Kilometers per second, handing off to the rocket’s second stage for the final push into orbit via a six-and-a-half-minute burn of its MVac engine. When Dragon was sent off on its journey ten minutes after lifting off, the first stage that helped send it into orbit was already back at Florida’s Space Coast, standing in Landing Zone 1 after becoming the first booster to master two land-based recoveries and the 20th overall recovery success for the California-based launch provider. Dragon – dispatched into an initial orbit of 204 by 356 Kilometers, 51.64° – completed its first critical steps immediately after separation by priming its thrusters and deploying its two power-generating solar arrays. Less than twenty minutes after taking off from Florida, Dragon, the Falcon 9 second stage and the two tumbling solar array covers that were jettisoned by Dragon provided an impressive sight when passing over Central and Eastern Europe still bathed in sunlight while observers on the ground were already in darkness. 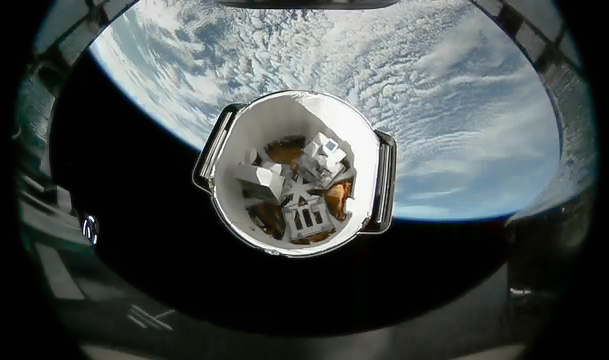 Two hours into its mission, Dragon opened up its GNC Bay Door to reveal its attitude sensors and proximity navigation instruments as well as the grapple fixture needed by Canadarm2 to latch onto. Later on Friday, Dragon began a methodical orbit-raising operation to catch up with the Space Station in its 403 by 406-Kilometer orbit. By Saturday evening, Dragon was tracked in an orbit of 303 by 464 Kilometers which, although having a higher peak altitude than ISS, still allowed Dragon to catch up with the Station. 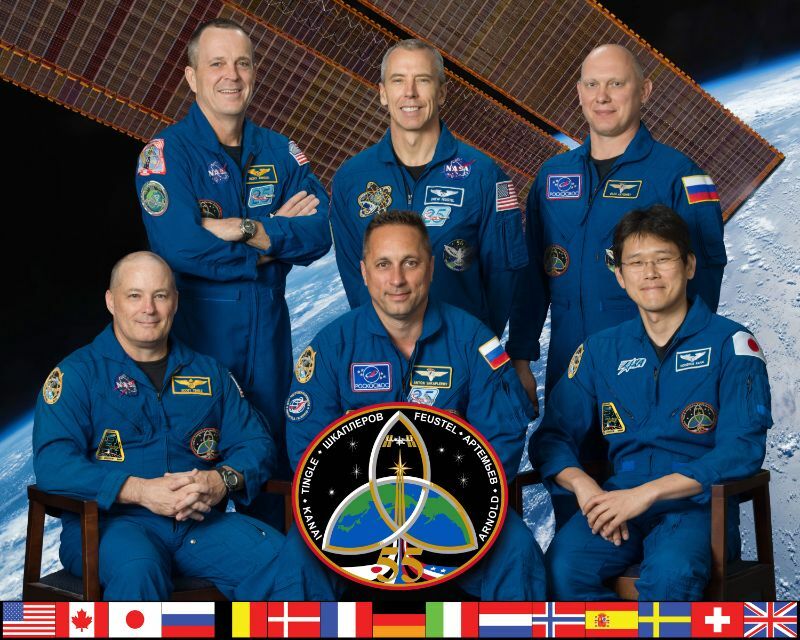 Further orbital adjustments on Saturday slipped the spacecraft back into a slot below and behind the Space Station for the initiation of the rendezvous in the early hours on Sunday. A Height-Adjust & Coelliptic Burn Pair put Dragon into an orbit 2.5 Kilometers below the Space Station where it entered the 28-Kilometer communications zone around ISS at approximately 6 UTC on Sunday to begin the relative navigation phase of the rendezvous. 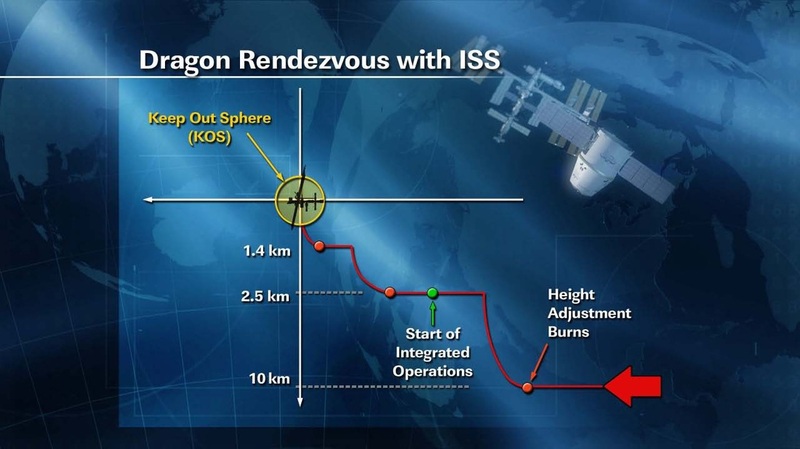 Through the space-to-space communications link with ISS, Dragon received GPS data from the Station to compare to its own in order to obtain a more precise relative position fix than with absolute GPS. The HA/CE-3 burn pair and two mid-course corrections placed Dragon 1.4 Kilometers below ISS, still catching up from behind. The Approach Initiation maneuver, performed around 8:25 UTC, placed Dragon onto a path to a point directly below the Space Station, transitioning into its R-bar approach. Dragon acquired the R-bar at a distance of 350 meters and held for a 180-degree yaw maneuver to properly position the grapple fixture and point the thrusters to the correct direction for a possible abort maneuver. With Dragon on approach, Expedition 54 crew members Mark Vande Hei and Joe Acaba took their positions in the Cupola to set up the robotics system for capture and monitor Dragon’s trajectory. After the yaw maneuver, Dragon proceeded straight up the R-bar until reaching 250 meters where the spacecraft paused for 20 minutes to transition from relative GPS navigation to its Proximity Navigation Sensors featuring a LIDAR bouncing lasers off reflectors on ISS and a thermal imager to provide the relative geometry between ISS and Dragon. SpaceX Mission Controllers in Hawthorne, California assessed the performance of the proximity sensors before commanding Dragon back to approach mode to advance to its next hold point at 30 meters. 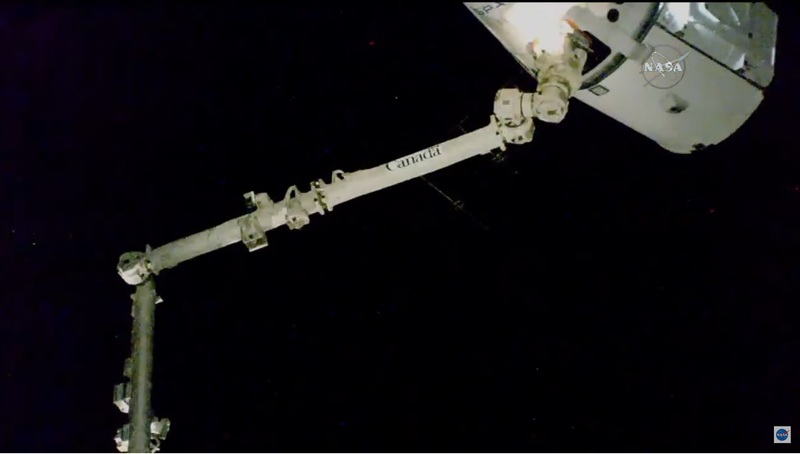 While holding at 30m, Dragon’s LIDAR was configured into single-reflector mode and the ISS crew went through the setup steps for capture, maneuvering the arm into its high-hover position. 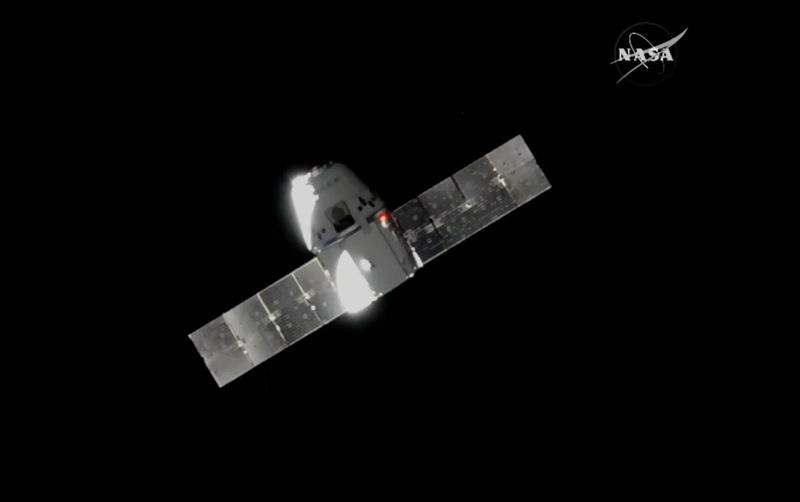 Gently pulsing its Draco thrusters, Dragon initiated its final approach at 10:30 UTC and slowly moved up to the Capture Point located 11.4 meters from ISS structure. 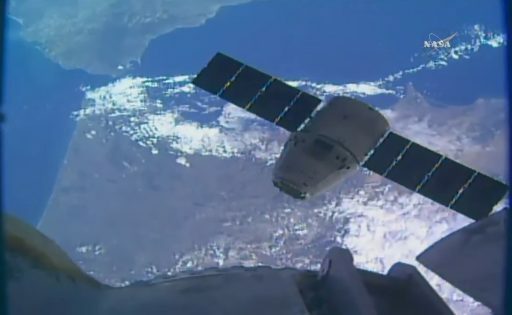 Coming to a hold at the Capture Point after a 20-minute final approach, Dragon nulled out any relative motion between itself and ISS while the crew re-positioned cameras and took the brakes off the robotic arm. Once final verifications by Mission Control were complete, the ‘go’ was radioed up to the crew to put the capture sequence in motion with Vande Hei operating the robotic controls and Acaba handling communications and watching over Dragon’s status. Tracking Dragon’s grapple fixture, Vande Hei brought the robotic arm’s Latching End Effector into alignment with the grappling pin before pulling the trigger and moving in for the capture with the end effector placed above the grapple fixture. 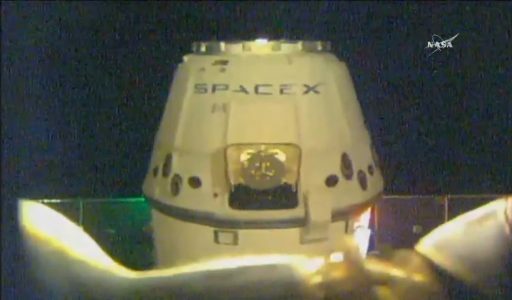 Snares were commanded to close and a firm grapple of Dragon was confirmed at 10:57 UTC at a mission elapsed time of 43 hours and 21 minutes. With Dragon successfully tamed, the crew handed robotic duties off to ROBO ground controllers who will complete the berthing of the spacecraft to the Earth-facing port of the Harmony module. 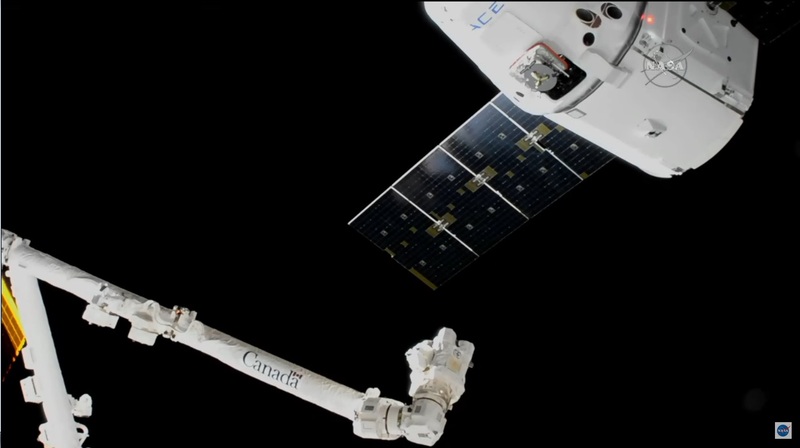 The 18-meter long Canadarm2 will first maneuver into the predicted capture position from where pre-planned maneuvers exist to swing the spacecraft around to face Harmony, also allowing cameras to inspect the craft’s Common Berthing Mechanism and the three pressure seals therein. Once in position at Harmony, Dragon will be positioned with millimeter accuracy, aided by the Centerline Berthing Camera System and four ready to latch indicators which have to show green before Dragon can be bolted down. First stage capture will be achieved by closing four capture latches upon which the robotic arm can switch to limp-mode to give Dragon some wiggle room to be pulled towards Harmony when the CBM bolts begin driving. Four groups of four bolts will be driven to tightly pull the spacecraft’s CBM toward the Harmony module and form a structural and pressure-tight interface. Once each of the CBM bolts has been loaded with a specific torque value, the crew will be cleared to pressurize the vestibule between Harmony and Dragon for leak checks before opening up the Node 2 hatch to gain access to the cavity. Typically, Dragon hatch opening is not planned on arrival day; however, it is desired to proceed into vestibule outfitting to have at least one power jumper in place between ISS and Dragon to allow the vehicle to draw power from ISS. Once Dragon’s hatch is open, the two USOS crew members – to become four on Tuesday when Soyuz arrives – will have their hands full transferring 1,560 Kilograms of cargo packed into the pressurized section of Dragon and performing a number of experiments that made their way up on Dragon and are expected to return to Earth aboard the same spacecraft. 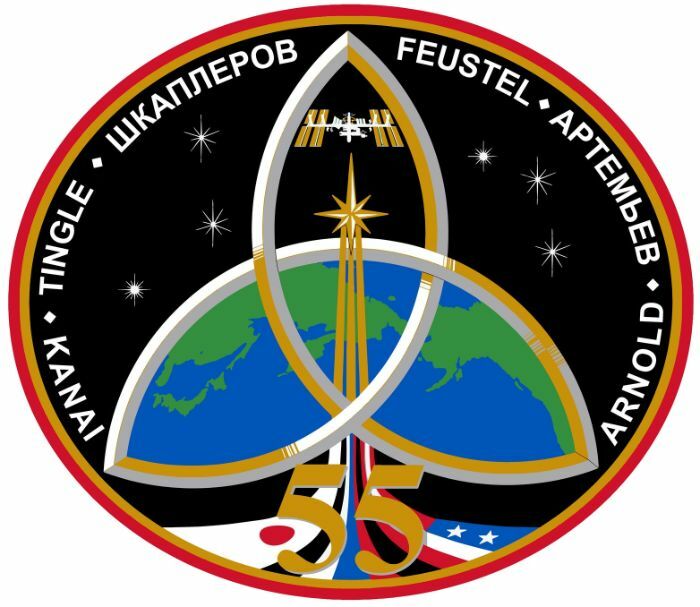 The SpX-13 mission is currently looking at a month-long stay at ISS – departure and landing are planned in mid-January with refinement of the exact schedule expected over the coming weeks. The pressurized cargo riding on Dragon SpX-13 is mostly utilization-related, comprising 711kg of science gear, 490kg of crew supplies, 189kg of maintenance hardware and 165kg of EVA hardware in the form of a refurbished space suit as ISS gears up for a series of EVAs in the January/February time frame.